When you are looking for the best locksmith in Powder Springs, please call Hallford Brothers Security Lock & Safe at 770-422-2483. We have been in business since 1963 and served Atlanta and the suburbs with Great Pride and Excellent Service. We are your professional locksmiths who will help you with all of your needs! Please call, or come in to our showroom in Marietta near the Square. Hallford Brothers Security Lock & Safe has been taking of security needs for over 50 years and is the name to trust in the Northwest Metro Area. 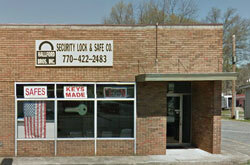 We have the Knowledge and Expertise to help you with your lock and safe related problems. We are bonded and insured so that you can trust in us! We’re an Insured and Bonded Company and are here to help you! Call us now at 770-422-2483!